I was recently given the opportunity to watch '54 Days' which is an independent feature film by Australian Director Tim R. Lea. It follows the story of 5 survivors who find themselves locked away in a steel bunker to save themselves from a recent nuclear attack that has obliterated Australia and most of the world. As they begin to run out of food, water and oxygen they realise that somebody is going to have to sacrifice themselves so that the others can survive. Almost immediately I was impressed by '54 days' and it's high quality; the locations and settings go above and beyond to create a sense of verisimilitude in the diegetic world, making things more believable. From the start the viewer is lured in to a sense of false security, it's a friendly party atmosphere and although there are several inner conflicts it appears as if there's not a care in the world. I have a lot of respect for someone who is talented enough to create a film that is set in one location and still manages to keep the viewer interested in what's going on. The different stages of emotions and panic throughout the group are reflected in the mise-en-scene and smartly placed camera angles, allowing us to almost feel as though we are trapped alongside them. The viewer isn't given much information on the main characters but I think this adds to the storyline, there are subtle hints throughout the film in regards to actions and interactions with other characters that allow us to get to know them a little bit more but the fact that we do not know any of these people makes things a little uneasy. Who can we trust? Who will be the first to snap? '54 Days' keeps you guessing all the way through and I was surprised to find that in the end, I had no idea what was about to happen. Michela Carratini (Michelle) portrays a young woman in an unhappy marriage and later in the film we discover that she is pregnant which adds another layer to her character, we sympathise with her more than the others. Carratini plays the role incredibly well, showing the inner turmoil of a pregnant woman who believes she is about to die and as she deteriorates even more with time, she makes it believable to the viewer. I think each part of the character development works well in contrast with one another; Dirk's strange obsession with the cockroach is to fill the void that is missing now that he has lost his daughter. Anthony loses his temper quite easily and talks down to the women, which gives us information on why Michelle has been unhappy with him. Elizabeth tries to keep the peace but after several drinks becomes slightly irate and unpredictable, leaving the viewer wondering whether we can trust her or not and last but not least, Rob who we are introduced to as 'the other man' and when he comes down to the bunker covered in blood it doesn't take a genius to figure out that this guy isn't to be trusted. The bunker in which the majority of the movie is set has incredible attention to detail, from the cracks in the stone walls, to the cold, hard flooring. The props used also help to create the atmosphere and add a sense of reality, with it's cold metal bunk beds, tattered lockers and dirty furniture. It's obvious each shot, each tiny detail has been given a lot of thought to make the film credible and I really enjoyed watching it. 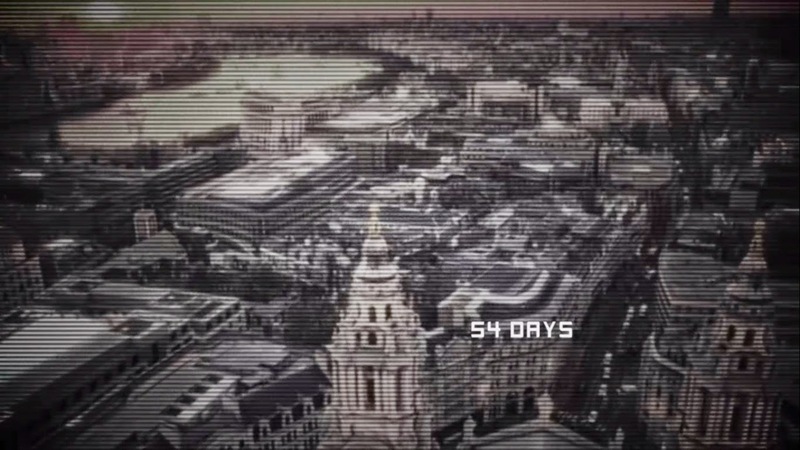 The countdown throughout the film is a fantastic touch, it adds tension and pressure on the characters which is reflected in their actions as well as how they look. As the timer runs down the shots become even more fast paced to give a sense of time passing much quicker than expected. My only problem with '54 Days' is that I felt that there were several unanswered questions; one of them being where did the gun come from that Michelle used? And why did Elizabeth turn on her friends when she had been so desperate to keep them all alive? Overall, I found '54 Days' to be a gripping film which looks in depth at human character's when forced in to a survival situation. It's a film I would definitely watch again, as I am a sucker for anything to do with apocalyptic situations so when you guys get the chance, please go and check out the website for the film.